• Reliability – Redundant Power Supply (RPS) backup options helps keep devices running even in the event of a power outage. Office essentials including phones, IP Cameras, wireless access points, and card lock systems can all be powered using PoE enabled switches, like NETGEAR’s new series of Smart Managed Pro Switches. 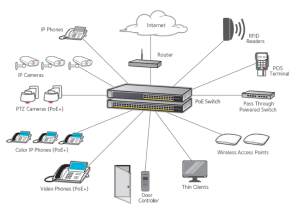 NETGEAR provides PoE options that can adapt to the needs of each business, whether in the hospitality, catering, education or retail domains. NETGEAR’s latest four Gigabit switches with Power-over-Ethernet (PoE+) and SFP ports for fiber uplinks expand the second-generation family of Smart Managed Pro Switches purposely designed for SME’s who have or want converged networks, where voice, video, data, and IoT are all carried on a single network platform. The Smart Managed Pro switches are also equipped with enhanced security features to protect vital company and client data from malicious intents. To see all the PoE options from NETGEAR, be sure to visit our website.